Candi Muara Takus The Forgotten Kingdom In Sumatera merupakan tulisan dari F.M. Schnitger, Ph.D peneliti dari Belanda yang berkeliling Sumatera sekitar tahun 1930-an. Salah satu bagian tulisannya adalah berjudul "KAMPAR" yang menceritakan tentang aktifitasnya di Candi Muara Takus (Tjandi Moeara Takoes). 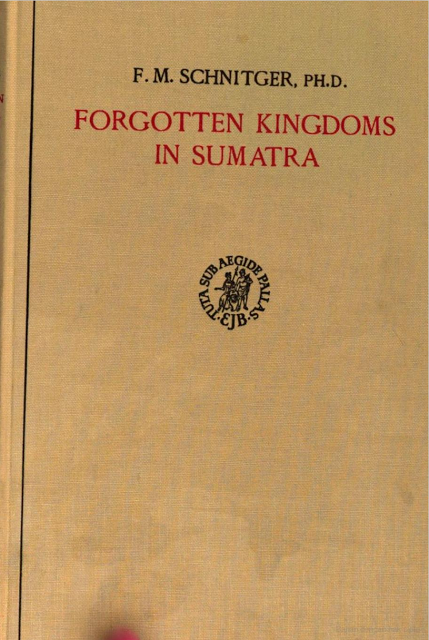 This book gives a few sidelights on the wilderness of Sumatra, with its attractive people and remarkable animals, with its ancient, vanished civilizations and forgotten kingdoms, the tragic ruins of which lie burled in the jungle. Tulisannya dimulai dengan kejadian langsung atas diri Schnitger dan beberapa pekerjanya saat kedatangan gajah dalam jumlah banyak. Saat itu Schnitger berada di rumah kayu sebagai tempat kerjanya untuk meneliti Candi Muara Takus. Gajah-gajah itu datang dengan cepat kemudian mengelilingi komplek candi bagaikan sebuah ritual wajib, menggesekkan badannya ke candi yang tertinggi. Ritual berikutnya adalah memandang candi itu dengan seksama dan kemudian gajah-gajah itu berlutut sebagai penghormatan kepada raja mereka yang telah tiada dan dikebumikan di sana. Schnitger melakukan penelitian di Candi Muara Takus atas biaya dari Royal Netherlands Geographical Society yang diketuai saat itu oleh Prof. J. P. Kleiweg de Zwaan. Penelitian Schnitger ini juga mencakup penelitian ke Nias, Batak, Jambi dan Palembang. Schnitger melakukan penelitian dengan cara menggali dan membersihkan sebagian areal kawasan candi. Dia memperkirakan bahwa Candi Muara Takus (Tjandi Moeara Takoes) didirikan pada abad ke 11 dan abad ke 12 Masehi. Candi ini dibangun dengan dikelilingi oleh dinding sebagai bagian dari sebuah kota yang memiliki luas 1,25 km. Bangunan candi dikelilingi pagar berukuran 74x74 meter yang terbuat dari batu. Pada bulan April 1935, Schnitger menggali pondasi batu di tengah gerbang utama yang menghadap utara. Berhadapan langsung dengan gerbang terdapat sebuah bangunan megah yang disebut Mahligai Stupa (Maligai Stupa) yang berukuran 9,44 x 10,60 m.
Penelitian Schnitger sangat luas dan diketahui bahwa di tahun 1003 Masehi, Raja Se li chu la wu ni fu ma tiau (Cri Cudamaniwarmadewa) mengirim utusan ke China sambil membawa tanda kehormatan dan pemberitahuan bahwa di daerah raja tersebut telah didirikan sebuah candi Budha untuk persembahan dan tempat sembahyang agar kerajaan tetap selalu jaya. Raja itu melalui utusannya meminta agar bangunan candi itu diberi nama dan juga meminta sebuah lonceng yang akan dipasang di candi tersebut. Diketahui kemudian bahwa candai tersebut diberi nama Cheng Tien Wan Shou (Tjandi Boensoe atau Tjandi Boengsoe). Schnitger juga menulis tentang kisah Poetri Doenia yang memiliki seorang anak bernama Indo Doenia. Bahkan penjelasan tentang kejadian ombak Bono Kampar dan sejarah terjadinya 7 hantu ombak Bono pun disampaikannya. Paragraf terakhir dari tulisan Schnitger pada bagian "Kampar" ditutup dengan penjelasan tentang penyatuan Rokan dan Tanjung (Tandjoeng). The vast, silent night broods over us and from afar comes the sound of elephants. For a week we have been camping here in the jungle of Moeara Takoes, situated on the Kampar, a river which curves about the equator like the coils of a mighty serpent. It is lonely here, the full moon casts a strange, sinister light over the ruins. Silent, majestic night; the crickets sing and their voices mingle with the murmuring of the river. It is far past midnight when I awaken with a start. Around me stand a group of natives. Midon, my best worker, bends over me. The fold of his white turban sweeps over my face. In his hand he holds a large, oldfashioned musket. With an effort I concentrate my thoughts and try to calculate the chances for escape… If we were in the temple court, on top of the highest ruin we would be safe. But how to get there? The distance from the house is about 100 m. If one ran hard… No, impossible. In imagination l already see the elephants running out from the underbrush! But there is still another possibility. Near the lodge the Kampar has a steep, abruptly descending bank. No elephant would dare to climb over the edge. If we can only reach this bank, we are safe. So said, so done. Stealthily as cats we descend and wait. A quarter of an hour later the ground begins to tremble and a tremendous racket fills the air. The rumbling of an elephant’s stomach may be heard for miles, but never have we heard it so near at hand. It is loud as a claxon and is caused by the crackling of masses of young leaves and branches which the huge beasts strip from the trees with the greatest enjoyment. Meanwhile they seem to talk and laugh in their hoarse voices, varied by shrill whistles and a trumpet-like blare. Dear little elephant that I once met in the zoo at Fort de Kock, how often l have fed you with peanuts and lumps of sugar. You told me you had relatives in the jungle of Moeara Takoes, cousins and aunts and an old niece by marriage. Well, they certainly made a terrific noise that night. All the time they remained playing and walking about the temple grounds and not until morning did they retire into the underbrush. That morning I shall remember as long as I live. At sunrise, tired and shivering, I climbed up the high river bank and took a look over the forest. I did not meditate long, however, but took my tapes and notebooks and went over to the temple grounds. Come, I would measure the gate. While I stood writing there came a muffled sound, not far from where l stood. It was as if something heavy had fallen on the grotmd. For a moment l had a vague suspicion, but quietly continued my work. Soon the sound came again, —it was as if someone were gathering firewood… and it must have been a tremendous worker, for suddenly the noise increased. Instinctively I dropped everything I held in my hands, hurried over to Tjandi Toea, the largest ruin, flew up the steps and crouched behind the central tower. For a moment nothing happened, for a moment deadly silence. Then with a thunderous roar a tree crashed down precisely on the spot where I had just been standing; the whole gate was covered by its branches. At the same time another crash resounded, branches were broken, the underbrush was torn aside. Two huge elephants rushed into the temple court, fighting and screaming, striking each other with their tnighty trunks and then, as suddenly as they had appeared they disappeared again into the woods on the other side. My heart beat in my throat, for out of the forest now came a third elephant. He remained standing in the sunlight, spread out his great ears. Slowly his trunk swung back and forth, seemed to search for something and then remained still. The antiquities in Moeara Takoes. 74 K 74 m.
At Moeara Takoes, on the right bank of the Kampar Kanan, lies a number of ruins from the 11th and 12th centuries. They formed part of a town, which was entirely surrounded by an earthen wall. The space enclosed measures about 1.25 km. The buildings are encircled by a sandstone wall, measuring 74 X 74 m. In April, 1935, I excavated the brick foundation of a great gate, approximately in the middle of the north wall. Since the surrounding wall is built over this foundation on opposite sides, the latter must be of an earlier date. Directly opposite the gate, on the south side of the courtyard, stands the best preserved building: the slender, graceful Maligai Stupa. The foundation has the form of a rectangle and measures 9.44 X 10.60 m. Inside, 52 cm behind the outer wall, is an older foundation decorated with pilasters. On the north side ascends a flight of steps, which have been twice rebuilt in the course of time. It is probable that at one time they supported a parapet with two kneeling elephants. Perhaps the gallery also had a low retaining wall. On the foundation stands a 28-sided pediment, decorated with blocks of yellow sandstone. From this pedestal ascends a round tower. As may be seen from the drawing the body of the stupa rests on a double lotus cushion. Within this flower is an older lotus. The crown of the stupa seems to have been 36-sided; on four sides were placed sitting lions of sandstone. The 36-angled section is followed by a regular octagon above which extends a frieze with 16 lion heads. The dome consisted of a sandstone lotus, which no doubt formerly supported a stupa. In the center of the tower was once a hole, about 2 m deep, in which rested a wooden mast, bearing several sunshades, one above the other. East of the Maligai Stupa lies a rectangular terrace, 5.10 X 5.70m with an extension and a flight of steps on the north side. On the outer wall are pilasters. West of this stupa lies a similar terrace, called Tjandi Boengsoe. It formerly supported a 20-sided foundation, with a stupa in a wreath of smaller stupas. It recalls the upper terrace of the Boroboedoer. At the later period this brick terrace was enlarged on the north side by a sandstone stupa. On the east side ascends a flight of steps. On a high, 20-sided base rests a low 36-side base which beats a lotus. ln this lotus was found a hollow, filled with earth and ashes. Among the ashes lay three bits of gold-leaf and a golden plate, engraved with wajras and three letters. At the height of the 20-sided base lay a stone with 9 letters and in the middle of each side a wajra. Immediately north of Tjandi Boengsoe stands Tjandi Toea, the largest (though not the highest) building of Moeara Takoes. The greatest length is 31.65 rn, the greatest breadth 20.20 m. The ground story shows signs of recanstruction; the processional path has a very irregular breadth. The second terrace is lower, but like the first is decorated with limestone pilasters. On the east and on the west side ascend flights of steps with lions. The stupa proper rests on a 36-sided base. In the lotus only an empty hollow was found. East of Tjandi Toea I excavated a sandstone foundation measuring 13.20 X 16.60 m, while south of these ruins a foundation 5.75 X 5.75 m came to light. The temples of Moeara Takoes are probably the graves of royal personages. Malays say that the Hindoo ruler was transformed into an elephant, and for this reason great herds of elephants regularly visit the ruins to do homage to the spirit of their departed ancestor. Close to the temples is a shallow ford, which the animals cross whenever they descend from Mount Soeligi to the plains. It is remarkable that since time immemorial the stupa court has been their favorite play-ground, where they walk about and disport themselves allnight long by the light of the moon. During the excavations of April, 1955, we were able to verify this strange phenomenon from personal experience. When one considers the antiquity of animal trails in the jungle and the elephant’s extreme conservatism it seems likely that even centuries ago the animals betook themselves to Moerara Takoes, and for this reason the place had an odour of sanctity. The Malays must have considered it a socalled elephants dancing ground, such as are still known in India. This may also be the reason why the Hindoos built their temples on this particular spot. As long as the city lay here the elephants naturally stayed away, but after its destruction the jungle reclaimed her rights and the Lords of the Wood retrod their ancient paths. In the year 1003 the king Se li chu la wu ni fu ma tiau (Cri Cudamaniwarmadewa) sent two envoys to China to bring tribute; they told that in their country a Buddhist temple had been erected in order to pray for the long life of the emperor, and that they wanted a name and bells for it, by which the emperor would show that he appreciated their good intentions. An edict was issued by which the temple got the name of Cheng tien wan shou (Tjandi Boensoe / Tjandi Boengsoe) and bells were cast to be given to them. The oldest inhabitants of Moeara Takoes descend from the Princess Poetri Seri Doenia, who came with her family from Pariangan Padang Pandjang (Menangkabau). Her beauty became so famous that a Hindoo ruler asked her hand in marriage. The princess accepted his proposal under condition that he should build a palace for her. This the radja did, and the remains of this palace may still be seen at Moeara Takoes. Then the radja returned to his own country to make preparations for the wedding. In the meantime a great Batak army marched on the city. A relative of the princess, named Soetan Palembang, wrote a letter to the Hindoo ruler, giving the messenger a basket (gantang) of seed. As numerous as the seeds in the basket, so numerous were the Bataks. The Hindoo ruler, however, did not return. When the Bataks arrived at Moeara Takoes they found the entire city deserted. Poetri Sri Doenia with her followers had fled into the forest and married a datoe from Menangkabau. She bore a son, whom she called Indo Doenia and to this day there is a place in Moeara Takoes called Galangan lndo Doenia. This youth later became lord of Moeara Takoes and was succeeded by Radja Pamoentjak (Datoe di Balai), known in history during the period when the country was converted to Islam. Another legend is as follows. One of the last rulers of Moeara Takoes (or Takoei) was named Radja Bitjau. The city was then so large that a cat could wander from roof to roof for three months before reaching the last house. The king had only daughters. When the eldest was about to marry the maharadja of Djohore, all manner of people came to attend the feast and the cockfights. Among the guests were the brothers Singa Mendjadian and Singa Mendedean, who had just settled in Goenoeng Malelo (upstream) and who had come originally from Rau. Others, however, assert that they came from Palembang. One of them asked for the hand of one of the king’s daughters, but was refused because he had a hideous skin desease. He now sent his sister’s child (kamanakan) with a basket of grain and his own head kerchief to his brother, Singa Merdekeh, radja of Koeamang (Panti) and asked him to send as many soldiers as there were grains in the basket. The Bataks now came with a huge arme and attacked Moeara Takoes. In this battle the last radja, Pandjang Djoengoer, lost his life. At Batoe Besoerat the Bataks threw a calligraphed stone into the river and said, “When this stone appears again above the water we, too shall return”. At Pamatang Gadang, however, they met with resistance. Here great trees were piled up and hurled down upon them. Many corpses were crowded into the stream and their terrible stench gave it the name Soengei Siboesoek. From here the bodies came into the Kampar and floated past the place which henceforth was called Bangkai-inang or Bangkinang (Batak for corpse). The name “inang”, meaning “mother”, was used for Batak, because when frightened or surprised they always exclaim, “inang”. it is told that in ancient times there was an underground stream, connecting the Kampar Kanan with the Kampar Kiri. The legend tells of a certain Indo Chatib from the soekoe Bondang, who once went fishing in the neighbourhood of Koto Ajer Tiris. He pursued a fish which had hidden in a hollow in the river bank. But lndo Chatib kept a firm grasp on the line by which the fish was caught and so could easily follow the fugitive. At last he arrived at the Kampar Kiri. A more credible tale relates that formerly there was a stalactite cave near the village Batoe Balah. The water which trickled down formed a stream, which flowed underground to Goenoeng Sahilan. Moeara Takoes was formerly called Si Djangkang (a plant) or Telago Oendang. The name is said to be derived from Takoet, the name of a tributary of the Kampar, so called because at this place the people began to fear the lords of Moeara Takoes (takoet = fear). This kingdom once ruled over all the surrounding country, and the recollection of this fact has not yet faded. To this day the ruler of Rokan must make a pilgrimage to Moeara Takoes before his coronation to have his head annointed with lemon juice. And on the Queen’s birthday, when all the panghoeloes in Bangkinang come to pay their respects to the Controleur, the panghoeloe of Moeara Takoes leads the procession, under a golden umbrella. East of the temple buildings is the stream Ampamo, so called because the water is red as gold. Farther east lies the Boekit Katangta. It is glorious to bathe here in the Kampar. The water streams over broad slate banks. One simply sits down and allows the cool water to roll over one’s body. The high bank consists of red-brown and silver grey cliffs, soft as cake, in which grow numerous graceful ferns. Squirrels, with amusing, upturned wooly tails, frisk about in the underbrush, looking with mischievous eyes at the intruder. By full moon a great natural phenomenon takes place in the Kampar. A mighty tidal wave rolls in 60 to 70 km from the sea, destroying everything that lies in its path. A boiling, roaring wall of water six feet high is seen approaching, which crashes against the bank with a noise like thunder, dragging whole trees into its seething whirlpool. How this bono originates is not known. It also occurs in the Rokan, but is not so high not so dangerous as in the Kampar. Formerly there lived at the mouth of the Kampar a tribe called Singo Bono. Near Tandjoeng Semajang is a holy place, where many people come to pray. When the bono approaches there appears on the river a mysterious boat, rowed by invisible hands. The appearance of this spirit ship brings good fortune to the entire oountry. In ancient times there lived a great chief at Kampar, who had a lovely daughter. Her bosom was, however, half female, half male. Many men asked for her hand but in vain. The girl’s only friend was a dog. One day she became a mother and bore seven pups. Her father was overcome with shame and threw the animals into the river. But every time there is a bono the dogs can be seen returning, to seek their mother. They leap and growl and destroy everything in their way. But always they become exhausted and return again to the sea. At Koto Toeo, near Moeara Takoes, a number of golden relics have been preserved, of which the following legend is told. Datoe Djalo Mangkoeto once dreamed that he would obtain gold if he gave the emas the blood of a white karbau. Then he made a black karbau white with rice flour and slaughtered it, upon which the indoek emas emerged from the river in the form of a tortoise. The datoe bound him to the pillar of his house. But when the tortoise heard that he had been deceived with a whitened karbau he tore himself loose. A slave took away his shield. Then the animal went to the slave’s mother to beg for his lost shield. She restored it to him and now he gave the gold to the mother who bought the freedom of her son from Datoe Djalo Mangkoeto. In bygone days there was a man from Djambi, who sailed up the Rokan, and in the land of Rokan he ended his journey and remained for several months. His name was Pendek Alang Berkokok. He liked only easy work, if there was a beautiful woman in the village he made a conquest of her and every day he made a new quarrel. The Radja of Rokan wanted to drive him away or kill him and looked for someone in his own land bold enough to accomplish this deed. Now in Tandjoeng (Kampar) there was a brave man named Datoek Rangsang Kampar (D. nan Gadang Tjintjin), and Datoek Pedoeko Sangsamo was sent to bring him. They met in the mountains between the negeris Pendalian and Sibiroeang; there the dogs barked at each other. Sangsamo said that he was on his way to find Tjintjin. The latter, not wishing to betray himself, said that in 7 days he would bring Tjintjin to Rokan. Then Sangsamo said, “Where our dogs barked just now is the boundary between Kampar and the loeak Rokan,” and to this day the mountain range is called Boekit Kalaran Andjing. Tjintjin returned to Tandjoeng, called his son, Si Djoeang Pahlawan, and 6 days later went with him to Rokan. There he promised to help the ruler, after which he and his son found Berkokok and killed him. Now Tjintjin wanted as a reward something to which there would be no end. This wish caused great consternation in Rokan. The Radja sent out messengers. One of them came to Pendalian and there he found a child which he brought to Rokan. The child said, “Let this be the reward, that Rokan and Tandjoeng be united”. And so it was. [Moeara Takoes sebelumnya disebut Si Djangkang (tanaman) atau Telago Oendang. Nama ini dikatakan berasal dari Takoet, nama anak sungai Kampar, disebut demikian karena di tempat ini orang-orang mulai takut akan raja Moeara Takoes (takoet = takut).